This is a sponsored post written by me on behalf of Van’s Foods. All opinions are entirely my own. 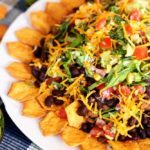 Flavorful, easy, and gluten-free, these Haystack Nachos make for the perfect snack, appetizer or dinner meal! You will love them! Hey There!!! Super excited to announce this $100.00 Gift Card Giveaway, $25 in Van’s Coupons and a cute lunch set! Details are at the bottom of the post! Make sure to read all the way down!! But the truth is, I wasn’t ready to break up with Haystacks….so I had to figure out a way to make this dish nutritious and delicious. And I did. When Van’s released their Say Cheese! gluten-free crackers, I knew these would incorporate perfectly into my new version of this dish. These Say Cheese! 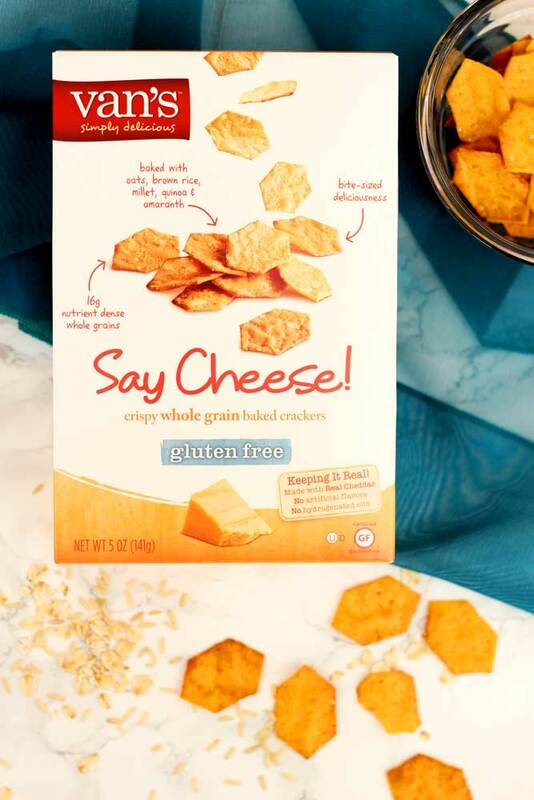 gluten-free crackers totally have a terrific cheesy flavor and also have a perfect crispy crunch! And with 16g of nutrient-dense, gluten-free whole grains, they’re a snack everyone will love! 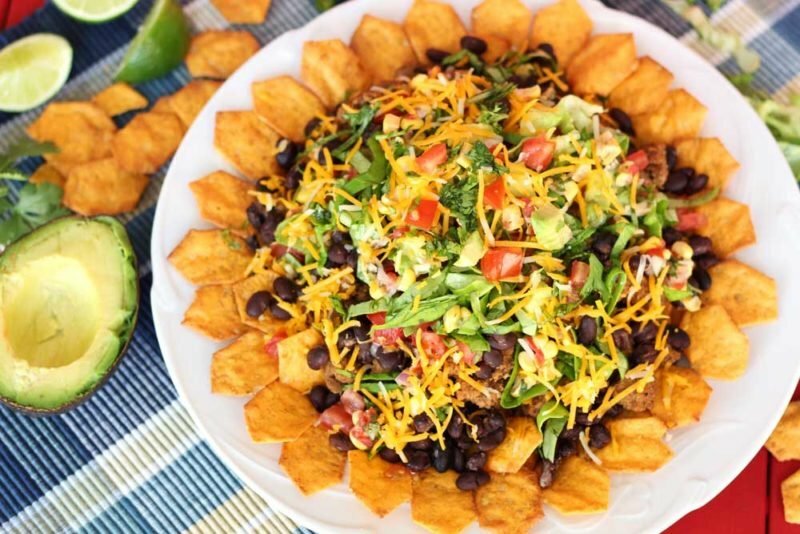 So heck yeah, they became the perfect substitute for those corn chips! Ok, so let’s talk about how I changed this recipe up to fit my lifestyle. Let’s talk ingredients for a moment. I decided to substitute corn chips with Van’s Say Cheese! Gluten-free Crackers. I switched out the refried beans with black beans. Instead of using store bought guacamole and sour cream, I introduced fresh avocado, Colby Jack cheese and tomato. Using fresh ingredients make a world of difference when it comes to taste as well as nutrition. The fresh cilantro mixed with lime juice puts this one over the top! And if you choose to make this a vegetarian meal, have at it! But I chose to keep that extra protein in, substituting out the hamburger meat with lean ground turkey and made my own taco seasoning to mix in after browning the meat. Super yummy! So, hubby was a little nervous about my switching out his ingredients to more nutritional ones. At first, he wasn’t overly anxious to try this new dish but once he dove in, he was in love. This has now become our “go to” recipe for game day appetizers and date night in. The kids love digging into this pile of yum and this plate is gone within minutes! On a large plate, spread out a large handful of Van’s Say Cheese crackers Gluten Free Crackers. 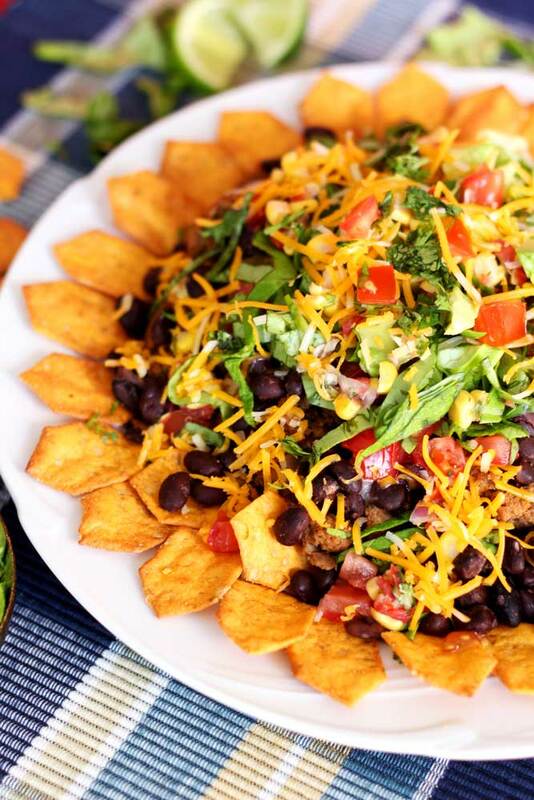 Flavorful, easy, and gluten free, these healthy Haystack Nachos make for the perfect snack, appetizer or dinner meal! You will love them! On a large plate, spread out a large handful of Van's Say Cheese crackers Gluten Free Crackers. 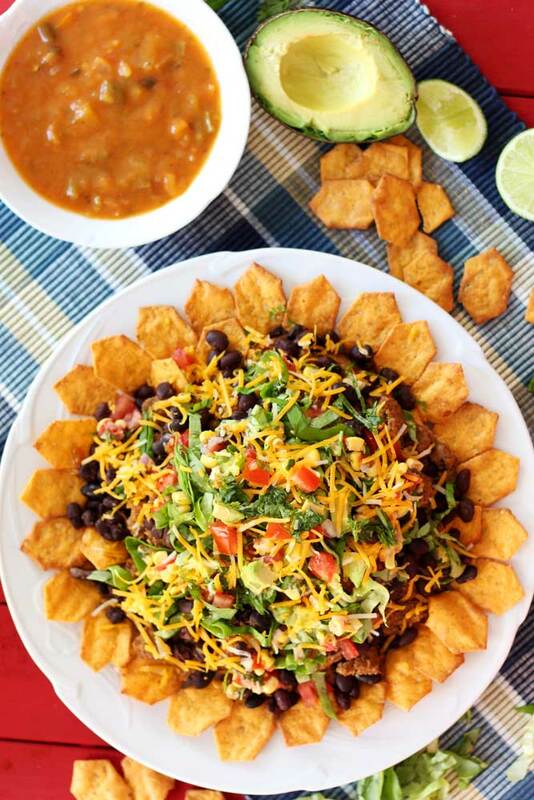 Don’t forget to pin these HAYSTACK NACHOS to your favorite GAME DAY, APPETIZER and SNACKS Board on PINTEREST! Now, let’s get to the giveaway for the $100 gift card, $25 in Van’s Coupons and a cute lunch set! Giveaway will run from Saturday, May 14, 2016 at 12:01am and end on Tuesday, May 31st 2016 at 11:59pm. Winner will be contacted via email directly by me and/or Van’s. Email address will never be given out to any third party or anyone. To enter, simply log in via Facebook or by using your email! If any questions, send me an email at amandasgreatrecipes@gmail.com. Good luck! Such a bright and lovely salad! Always looking for good gluten free dippers! I’ll have to search these out! This looks like an amazing snacky dinner or appetizer! Ok, so those are for me — what are you having? 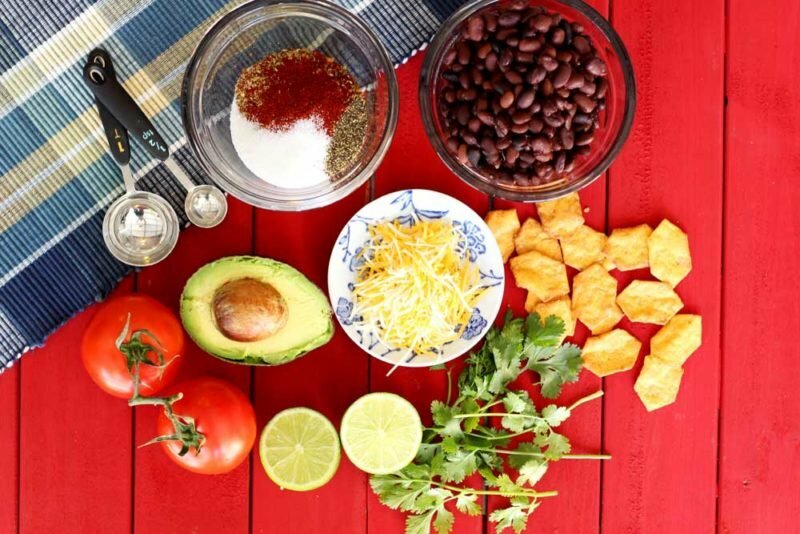 Looks delicious — just need a margarita! 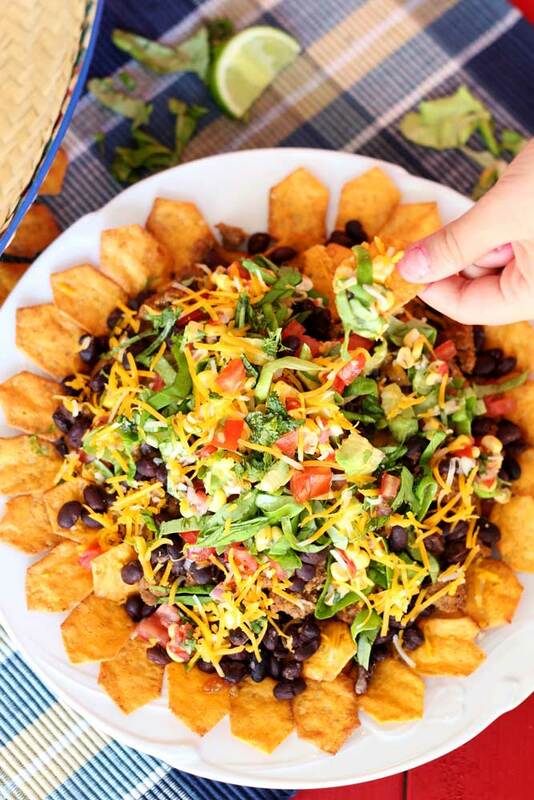 These nachos would be perfect for any game day or even a party over the summer. I love Van’s crackers and usually just enjoy them out of the box but I will have to give dipping into this haystack a try.